“They say when the Rider burns you, he burns your soul.” ABC has released a new promo for season four of Marvel’s Agents of SHIELD. 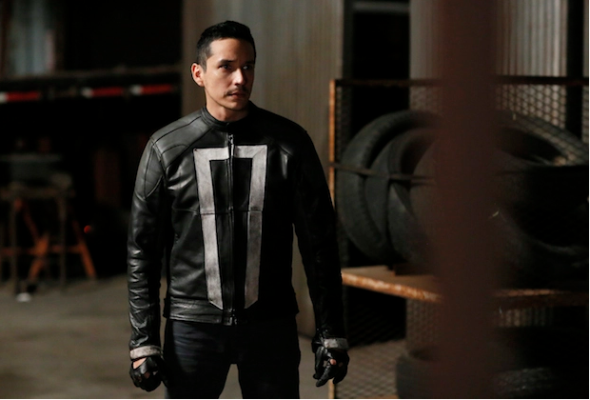 The preview features a sneak peek of Gabriel Luna as Robbie Reyes, a mechanic who turns into the demonic Ghost Rider. Luna joins regular castmembers Clark Gregg, Ming-Na Wen, Brett Dalton, Chloe Bennet, and Elizabeth Henstridge. Season four of Marvel’s Agents of SHIELD premieres on September 20th at 10 p.m. ET/PT. What do you think? Are you a fan of Marvel’s Agents of SHIELD? Are you excited about the introduction of Ghost Rider? More about: ABC TV shows: canceled or renewed?, Marvel's Agents of SHIELD, Marvel's Agents of SHIELD: canceled or renewed? Marvel’s Agents of SHIELD: Could Ghost Rider Get a Netflix Series?